Your Next Stamp Special Event Post! Hello! It's the 22nd of the month which means it's time for the YNS Special Event Post! 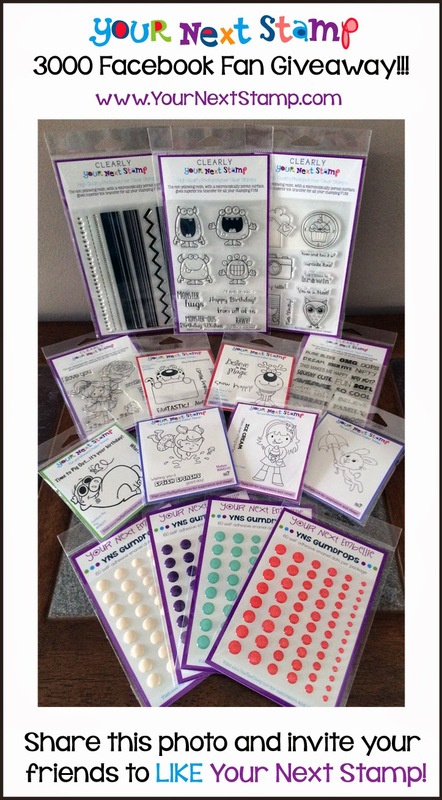 All of the DT members have projects to share using newer and older YNS stamps and dies:) You can see all of the projects HERE on the Your Next Stamp Blog and if you leave a comment you could win a YNS Stamp Set of Choice!!! For my card I used the adorable and fun set Cupcake Owl! I stamped the image and sentiment with Memento Tuxedo Black and colored the image with Copics. I cut it out and popped it up with foam tape. I added some ribbon and a couple of Holly Berry Red Gumdrops. The dp is Pink Paislee Hello Sunshine. Karen is also having a HUGE spring cleaning sale at the Your Next Stamp Store, so make sure you take advantage of the great deals!!! You can read more about the sale HERE! We'd also like to invite you to "Like" us on Facebook! We are trying to reach 3000 fans by our 5th anniversary on August 7th and if we do, Karen will give away a huge prize pack!